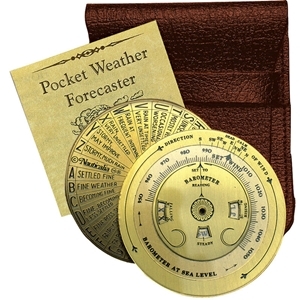 This little pocket forecaster, only 2" in diameter, is remarkably reliable for predicting general weather conditions in and around the British Isles in conjunction with a pressure reading from a barometer, and was a favoured instrument 90 years ago. Based on established meteorological principles, it is easy to read and inexpensive. Made of solid brass with a clear acrylic centre disc, the detailed tables and readings are acid-etched and picked out in black paint. In leather carrying case with instructions.